This makes a light, refreshing dessert after a rich main course. Toast the oatmeal by heating it in a heavy-based frying pan, stirring until lightly browned. Tip onto a plate and leave to cool. Beat the quark in a bowl until softened. Add the honey, yogurt and vanilla and beat until smooth. Stir in the oatmeal. 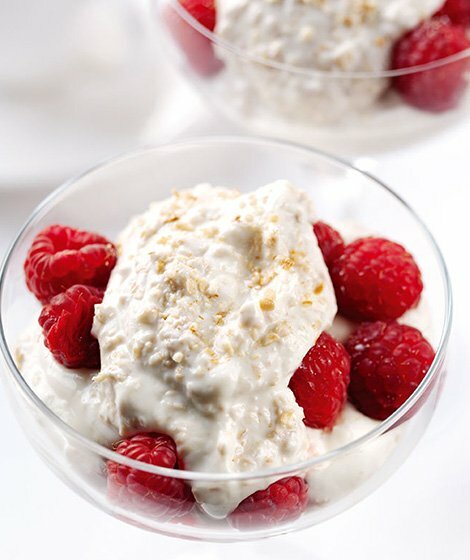 Scatter a third of the raspberries into four small serving glasses and spoon over half the oat. Scatter half the remaining raspberries on top and add the remaining oat mix. Scatter with the remaining raspberries. Use any other soft fruits instead of the raspberries. Sliced strawberries, or blueberries work very well. As an alternative to oatmeal, you can grind porridge oats in a food processor until they're broken up but not completely ground.